Text and photography copyright © Nye Simmons. All rights reserved. Following a storm, access to the better known parts of the Park is "iffy". The National Park Service is more concerned about visitor safety than you being able to skid into the high country for the image of a lifetime. Environmental concerns limit the sorts of road treatments used in the Park, and then there's the budget. The road crews work hard after a storm, but there are only so many drivers and trucks to go around. So be prepared to be a frustrated photographer. The good news is that there is great image making to be done from the Park gateways. Be prepared to walk a bit, and open your eyes, put on your 'boggan, and get to it. You won't cover as much ground as you would in your vehicle, but you might just see a whole lot more. The unexpected cold spell in December gave us 3 snow storms. I missed the first because of other obligations (the day job) but I was able to meet up with Richard Bernabe for the second one. We walked in from the Townsend "Wye" for a day in the snow. Some of the best images came from just to the right of the bridge adjacent to the parking area. Photograph from the bridge itself for aerial perspective or move down into the streambed for a different view. Just remember those footprints. You could easily trample your composition if you aren't careful. Snow caught up with us all too soon and limited photography for most of the day. Those little flakes streaking through the image are interesting only to a point. In general they are a buzz kill, though they offer some creative potential to the clever. I wasn't clever that day - the images are usable but not killer. Still, it was winter wonderland, and a good time was had. Always good to share time with Bernabe and absorb his perspective. 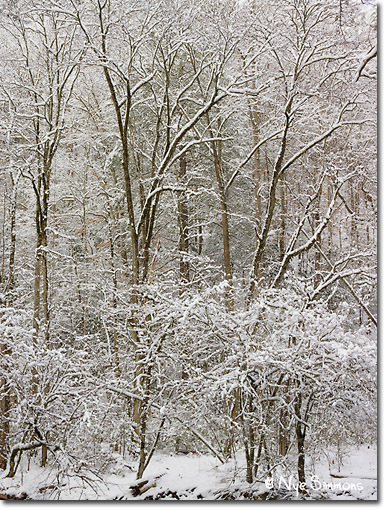 I was sort of "achy brakey" in my heart though, because I saw several images that just didn't work in falling snow. Hooray!! The Christmas dump left about 6 inches in Little River Canyon. The road was closed in the morning but it was still and cold, and the snow was just lying still on the branches. Time to start walking. Images were everywhere - tough to choose. I was in a more abstract mood, as you might guess from the pics, and it was a target rich environment. These tend to be busy images, monochromatic, and a bit difficult to put together. Quite a few just didn't work once they popped up on screen, but several were quite pleasing. The last two images of the day both made the final cut, as chance would have it. The little beech tree with the dried grass spray in the foreground was the closer. Just happened to notice it after stopping for the "drive by shooting" of the reflections on the Middle Prong - (vantage point the bridge), at the close of the day. There was a color wash on the water that was quite a surprise from light hitting the ridge above. 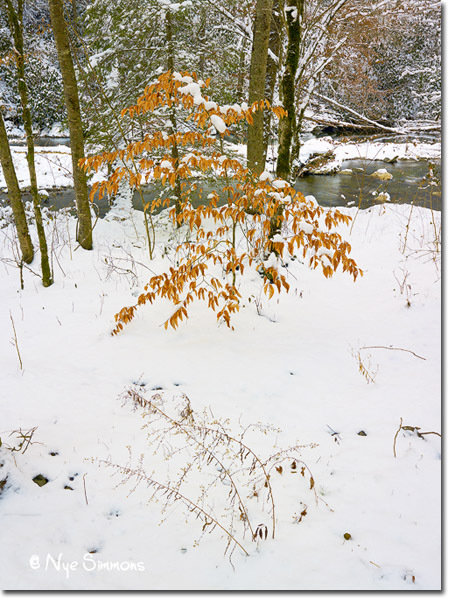 Quite an unusual color combination for winter, but just the sort of juxtaposition a photographer looks for - or at least a seasoned professional (wink wink). Technically it s not very challenging. Set your camera to auto white balance and your snow should be pretty clean. You could always shoot a grey card for backup. You can make minor corrections in PS or your RAW converter. Just remember, if you shoot RAW, you can fix anything that needs fixing, recover blown highlights (unless all three channels are blown, then you just get grey mush), change color balance, process twice for highlights and shadows and blend the two to get expanded dynamic range, etc. You do shoot RAW don't you? The biggest challenge is putting order to the chaos. 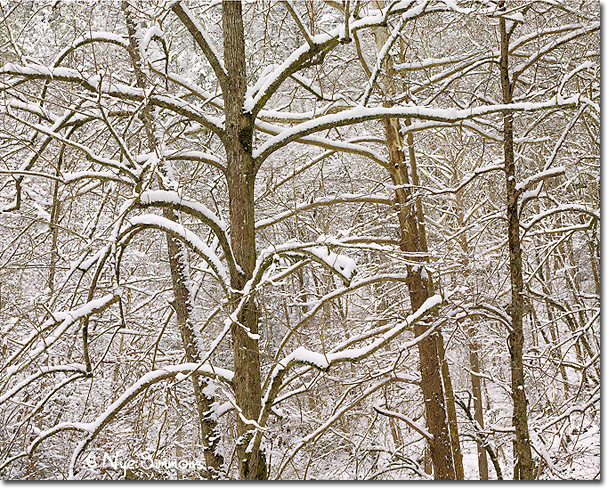 Look for patterns, strong lines and forms in the tree trunks all outlined in snow. Look for what color there is that might pop with a little contrast adjustment. Snow cleans up a lot of clutter but it creates challenges of its own. You wind up shooting B/W even if it wasn't your intent. Pay attention to comfort. Water bottles will freeze if not protected. So will your granola bars. Batteries are especially vulnerable. Lithiums and NimH batteries do better. Carry a spare battery tray that you can keep warm if it's really cold, and definitely spares. A small umbrella or other cover in case you have to change lenses, etc. while it's actively snowing is a big help. A pack cover or small tarp, etc. to put your pack down on (or the snow - if its cold enough it wont get wet) when photographing is a help. If you are going to be on anything steep, some sort of traction aid is a plus. Stabilicers, yak tracks, instep crampons, even golf shoes - there are several products out there. Ice is slippery, hard too - just ask Bernabe! Keep warm, keep smiling, get out there and shoot a few shots. Don't be deterred if the roads are closed. There are plenty of great images just a short walk from your car. Just get there when the last flake falls for the branches all covered in white. Comments on NPN nature photography articles? Send them to the editor. NPN members may also log in and leave their comments below. Nye Simmons is a fine art nature photographer from Knoxville, Tennessee. 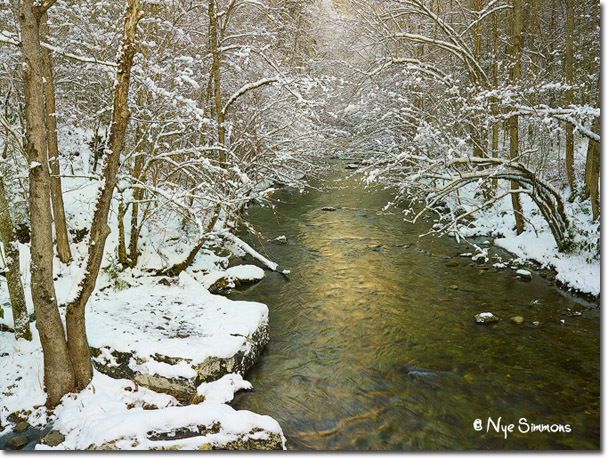 He is the author of five books, including The Smoky Mountains Photographers Guide, Best of the Blue Ridge Parkway, and Tennessee Wonder and Light. More of Nye's work can be seen at his website, Simmons Photographic Arts.